Archaeologists, led by Professor Jeroen Poblome, digging at a site in Turkey, have discovered a nearly 2,000 year old kitchen in the ruins of the ancient Roman city of Sagalassos. Originally part of the expanded Roman Empire, this city is located in the southwestern part of today’s Turkey. 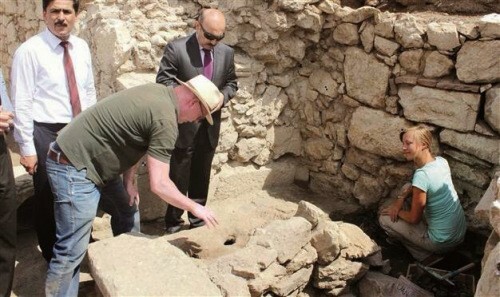 Professor Marc Waelkens and his team from Catholic University of Leuven, Belgium had been digging in this site since 1990, painstakingly uncovering the hidden city. Poblome’s team has joined them, and the archaeologists were delighted this summer to uncover a kitchen dating as early as 200 CE. If you could travel back in time and walk into this ancient Roman kitchen, you might not recognize it as a kitchen. There would be no stove—at least not the kind you would know. Instead, you would probably see a large pile of hot coals in the center of the room, forming a fire pit. A pot would be on the coals heating up a stew made of bulgur (cracked whole wheat) and meat. You might wonder why there were pots on either side of the stew pot. Their purpose was to help keep the stew warm because the hot coals would heat them as well, transferring the heat to the main pot. Today’s kitchens have gleaming floors of tile or linoleum. Don’t expect to see any tile or linoleum in this kitchen. The Romans simply packed dirt to form a hard flat surface. So if you are squeamish about germs, you might be pretty uncomfortable in an ancient Roman kitchen. This early kitchen did not have any quartz countertops as we have today, but they had tables. Ovens were not invented until the 6th century, but the early Romans did use a floor furnace for baking bread. This floor furnace was similar in design to the large furnaces used to heat bathwater in the city’s bathhouses. We love running to the refrigerator after school for a cold snack. In this ancient kitchen, there was no refrigerator. Electricity had not been invented yet, and wouldn’t be for more than 1700 years. Ice boxes, the forerunner of refrigerators, had not been invented yet either. Besides, this area of the world had little access to large chunks of ice to put in an ice box. Consequently, food could not be refrigerated. Instead, food was traditionally preserved by drying, smoking or salting. The ancient Turks also preserved their meat by pressing it, which is where we get the name “pastrami.” Beef and turkey jerky, raisins and sun-dried tomatoes, as well as smoked ham, pastrami and salami lunchmeat are modern day examples of these methods of keeping food fresh longer. The researchers were very surprised to discover that this ancient Roman kitchen had an early version of a sink in the middle the dining area. It was actually a small fountain. Because the city of Sagalassos was located near mountain springs and a river, aqueducts were constructed to carry water to the city. 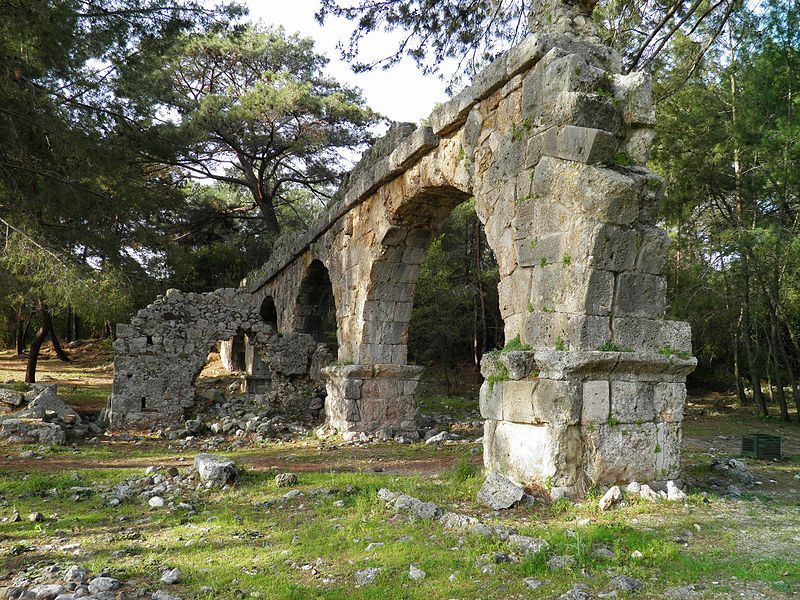 The earliest aqueducts piped water into the city’s bathhouses. Aqueducts were also built to bring drinking water directly from the mountain springs to fountains in the city of Sagalassos. Apparently, this kitchen was one of the places selected to have a fountain. With the large dining area and the fountain, it is possible that this particular kitchen might have been designed to feed a group of people rather than just a family. In those days, a religious or social commune, or a guild, might share a house. Communes were groups of people who shared the same beliefs or political views and lived together like a family. Guilds were groups of skilled workers who shared the same specialty, like potters or iron workers. So far, the researchers have also unearthed three rooms in this building connected to the kitchen. These appear to be storage rooms because they are still neatly stocked with ceramic dishes, spoons, glasses, cups and oil lamps. 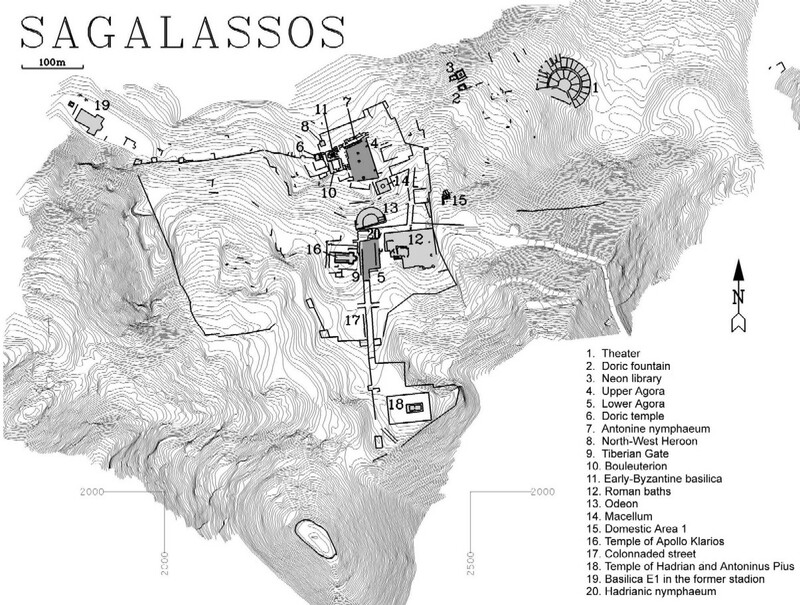 Map of the archaeological site of Sagalassos. Click to enlarge. Image credit: New England University. The archaeologists had also discovered something very strange about this ancient kitchen. All of the tables in the kitchen had been overturned. Plates and bowls and scraps of food were scattered on the floor almost as if the people eating had to suddenly jump up and leave, tipping over the tables. The archaeologists know that a major earthquake hit Sagalassos in the early 6th century CE, and a second one during the 7th century. 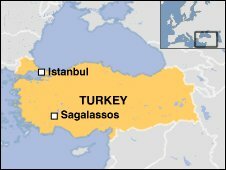 Sagalassos sits right on a recently discovered fault line. Carbon dating places the age of the kitchen at 200 CE—a good 300 years earlier than the first quake. Could the mess have been caused by earthquakes? The researchers aren’t convinced. This is because the storage rooms next to the kitchen are still well preserved with everything in place. So we are left with a mystery: Why were the tables tipped over? Since researchers have been digging in this buried city for 14 years, we might wonder if one of them could have accidentally knocked over the tables. Not likely. Work on the kitchen area only began four months ago. The tables, plates and table scraps have been undisturbed for a very long time. Besides, archaeologists are always extremely careful. They gently brush off the dirt and preserve and categorize each ancient item as they discover it. No, the evidence points to some other mysterious cause. A lot of dirt still needs to be removed bit by bit before the entire kitchen will be revealed. What other finds will be uncovered of daily life long ago? And maybe, when the archeologists do finish, they will also be able to figure out what could have happened to make this ancient kitchen such a messy modern mystery. Just for fun, go into your own kitchen at home and look around. Notice the cabinets, the counters, the tables and chairs, the sink, the stove and oven, the microwave, toaster, can opener and refrigerator. All of these conveniences have been invented since the time of the ancient Romans. How much easier do you think it is to cook and bake today than thousands of years ago? What challenges do you think ancient civilizations faced when it came to cooking without modern appliances? Can you think of other ancient civilizations that shared their eating areas? Do you know of any modern day communes? What would it be like to share the kitchen in your house with other families? 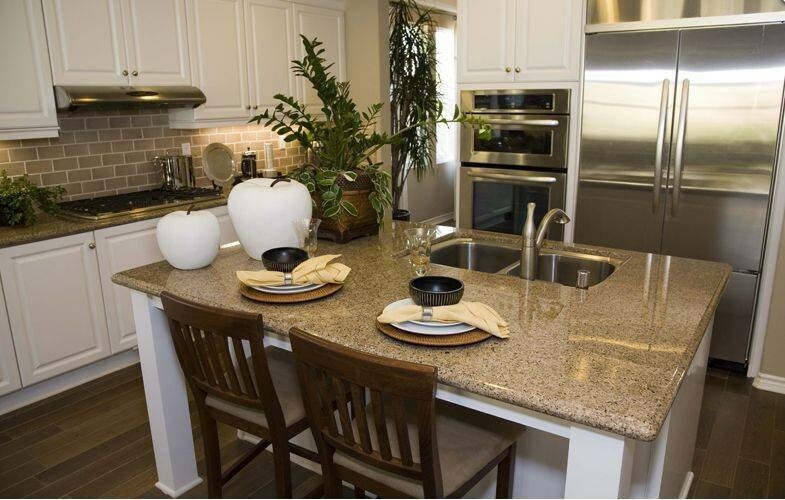 Do you think today’s kitchens are more sanitary and healthier? Why or why not? Do you think the ancient people were as concerned as we are about their kitchen and food being clean? Why or why not? Describe the differences between ancient Roman kitchens and ours today. Draw two pictures side by side on a piece of paper to show your kitchen and what you think an ancient Roman kitchen might have looked like. Use the details described in this blog to help you with the picture. Make a 3-D diorama out of a box to show what an ancient Roman kitchen might have looked like. Used colored paper, colored foam, cloth or felt to cover the walls, floor and ceiling of the “kitchen.” Cut out pieces to look like stones for the walls of the room and glue them on. What materials would you use to create your fire pit, floor furnace and pots? Look online to find out what a floor furnace looked like and what kinds of pots and dishes people used around 200 CE. Make your ancient Roman kitchen look as authentic as possible! Ancient kitchen found in Sagalassos. (n.d.). Retrieved October 6, 2014. Archaeological discovery sheds new light on Roman food culture. (n.d.). Retrieved October 6, 2014. ROMAN FOOD – L’ALIMENTATION ROMAINE. (n.d.). Retrieved October 6, 2014. Traditional and Indigenous Ways to Preserve Food. (n.d.). Retrieved October 6, 2014. Venticinque, P. (n.d.). Family Affairs: Guild Regulations and Family Relationships in Roman Egypt. Retrieved October 6, 2014. Archaeological discovery sheds new light on Roman food culture. This entry was posted in Architecture, Blog, Culinary, Culture, Kids Blog, Kids: Architecture, Kids: Culinary, Kids: Culture and tagged ancient cooking, ancient history, ancient oven, Ancient Rome, AntiquityNOW, Roman kitchen, Sagalassos, Turkey. Bookmark the permalink.